Box Text: Re-mastered exclusively for the Nintendo 3DS system. Fly Solvalou in a battle against Xevious forces. 3D Classics: Xevious revisits the popular vertical-scrolling arcade game, bringing back favorite elements of the original that can be enjoyed in 2D or 3D. In this enhanced version, view Solvalou from a mid-air perspective and gauge incoming fire from down below while the scenery and aerial enemies fly by. Pilot the advanced fighter-bomber through 16 hazardous areas and destroy as many targets as possible. Annihilate the Andor Genesis for extra points and earn a place among the high scores. 04-08-2015 desocietas Box Text Re-mastered exclusively for the Nintendo 3DS system. Fly Solvalou in a battle against Xevious forces. 3D Classics: Xevious revisits the popular vertical-scrolling arcade game, bringing back favorite elements of the original that can be enjoyed in 2D or 3D. In this enhanced version, view Solvalou from a mid-air perspective and gauge incoming fire from down below while the scenery and aerial enemies fly by. Pilot the advanced fighter-bomber through 16 hazardous areas and destroy as many targets as possible. Annihilate the Andor Genesis for extra points and earn a place among the high scores. 02-19-2014 karyann Description Re-mastered exclusively for the Nintendo 3DS system. Fly Solvalou in a battle against Xevious forces. 3D Classics: Xevious revisits the popular vertical-scrolling arcade game, bringing back favorite elements of the original that can be enjoyed in 2D or 3D. In this enhanced version, view Solvalou from a mid-air perspective and gauge incoming fire from down below while the scenery and aerial enemies fly by. Pilot the advanced fighter-bomber through 16 hazardous areas and destroy as many targets as possible. Annihilate the Andor Genesis for extra points and earn a place among the high scores. 01-22-2013 st01c Description Re-mastered exclusively for the Nintendo 3DS system. Fly Solvalou in a battle against Xevious forces. 3D Classics: Xevious revisits the popular vertical-scrolling arcade game, bringing back favorite elements of the original that can be enjoyed in 2D or 3D. In this enhanced version, view Solvalou from a mid-air perspective and gauge incoming fire from down below while the scenery and aerial enemies fly by. Pilot the advanced fighter-bomber through 16 hazardous areas and destroy as many targets as possible. Annihilate the Andor Genesis for extra points and earn a place among the high scores. This is a list of VGCollect users who have 3D Classics: Xevious in their Collection. 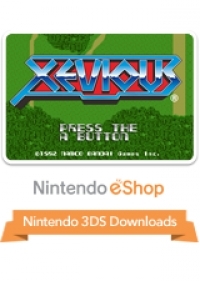 This is a list of VGCollect users who have 3D Classics: Xevious in their Sell List. This is a list of VGCollect users who have 3D Classics: Xevious in their Wish List.